Well that took long enough. Gamers in Australia have long awaited to get an R18 rating for videogames. For other forms of media in Australia, the R18 rating has been around. For videogames however, the highest the rating went was MA15. This was due to politicians believing that games were still for kids. But, like other governments around the world, they’re slow to catch up to changing demographics and not knowing that the common age for gamers has risen (those kids grew up after all). Since the R18 rating didn’t exist for videogames, games were either edited to meet the MA15 guidelines, banned, or simply considered for released there. Measure to pass R18 for videogames have popped up, only to be shot down at the last minute due to 1 or two members of their legislators not approving it (it has to be 100% unanimous). Thr R18 rating for videogames will take effect January 1, 2013. 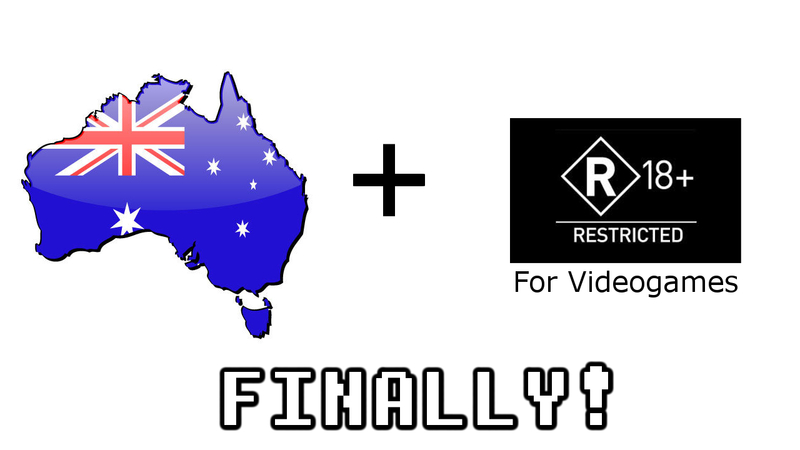 So rejoice Aussie Gamers! You earned it! This entry was posted in Gaming News and tagged australia, oflc, r18, restricted, the government finally grew up!, videogames on June 18, 2012 by Steven T..